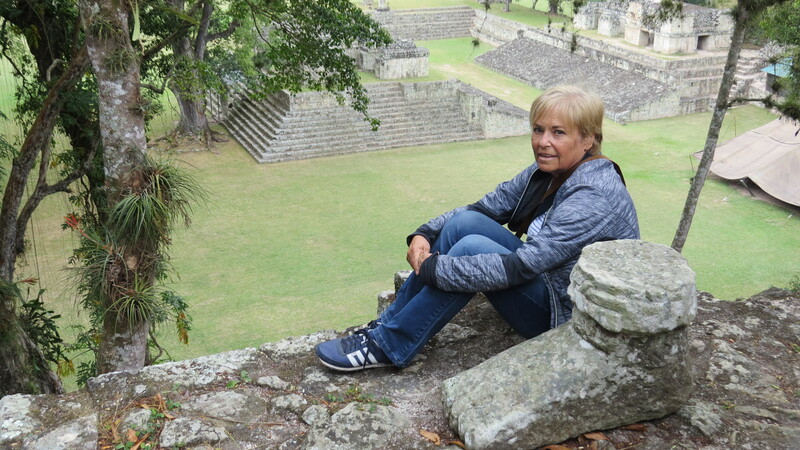 We left Antigua in good time, picking a route that skirted nearby Guatemala City by a wide margin, first on the Panamerican highway, then north on 3 and 4. Our drive took about four hours, the first half through lush mountains, and later a wide flat valley. We passed large affluent brick or cement homes painted in golden yellow or terra cota, with flowering trees of purple, yellow or white, hanging over the walls. This road had the most Auto hotels ever, where you pay by the hour and the price includes a garage to hide your car from sight. There were three police stops, each with a polite greeting, a look at our documents and we were sent on our way. We passed many roadside fruit stands spilling with oranges and pineapple and drove by large tomato fields, the workers all riding in the backs of trucks. Much of the area was farmland, pointy horned cattle grazing inside tight barbwire fences, with tree limbs used as posts. Before the border we camped at La Caballeriza, a hotel grounds that included bungalows, a restaurant, bathroom and shower block, a large clean pool, and two banquet areas, one just setting up for a wedding. In spite of the celebration, the loud dance music, and the numerous fireworks, we slept well, tucked out of sight behind the pool. Leaving early in the morning we arrived at the Honduras border about 1030 AM. First surprise was that the only road forward was under construction, with one lane of traffic let through at a time. Drivers were leaving their semis, and cars, in the middle of the road and walking toward the border. It was chaotic. Second surprise was that Guatemala and Honduras have recently almagamated their services, but the new building and parking was hidden by the mess of vehicles and construction. Finally figuring this out, we followed suit, left the van in the middle of the road, and joined the lineups in migración, one to exit Guatemala and one to enter Honduras. Those were straight forward. But then came the problem. We needed to cancel our Guatemalan van permit and get a new one for Honduras. There was one man in charge of the Aduana, el jefe, who said that we needed 4 copies of each document. Looking around at absolute chaos, I asked “Where is the copier?” He threw up his hands and walked away to watch the more interesting process of road construction. So I appealed to other officials. They kindly tried to help but it became obvious that this was something they had not done before. Two very nice women were finally finishing up with our paperwork, after making numerous phone calls to who knows who, when el jefe showed up and said he was going for a one hour lunch, adding loudly, “Its the regulation”. Eyes rolled but apparently in Honduras, you don’t argue with the boss. So Bob and I waited over lunch, sitting on a blue wooden bench in front of the Aduana, watching the construction. I was hoping jefe would lighten up after lunch, but no. He eventually sauntered over and indicated we should follow him. Slowly and methodically he processed our photocopies and 2.5 hours later we were on our way. Oh yeah, and sitting behind his desk were two Canon copiers. 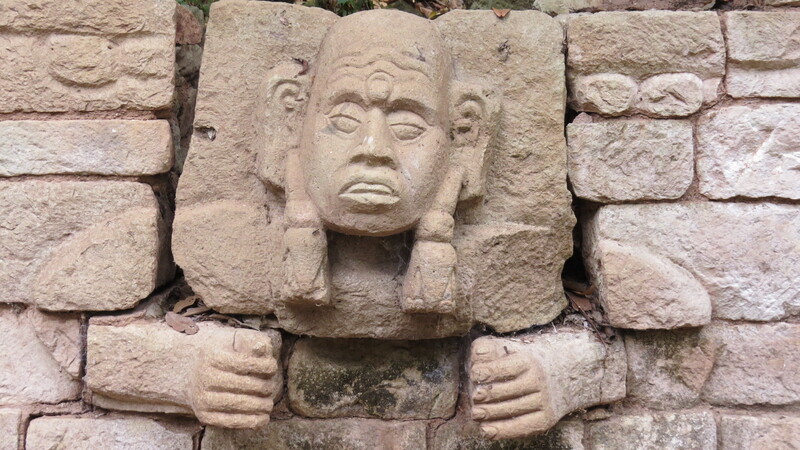 We camped 2 nights at a spacious grounds on the edge of the town of Copán. 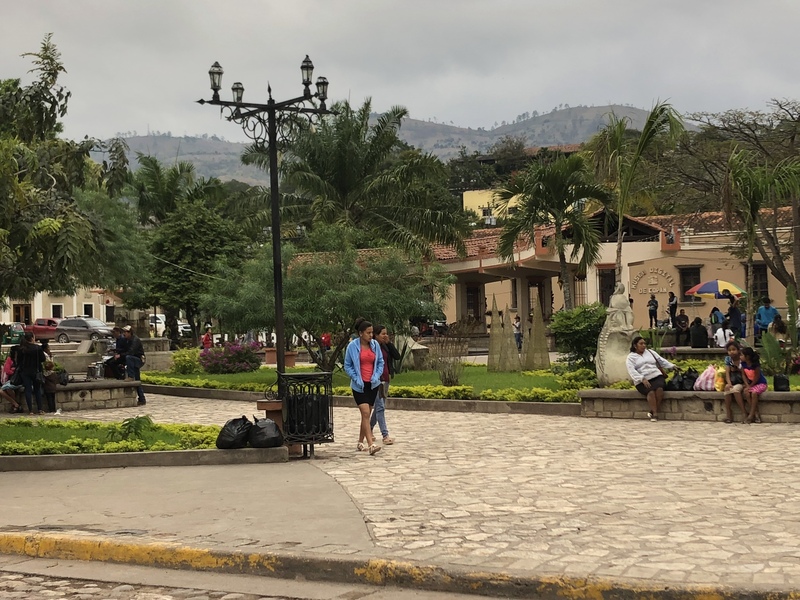 We enjoyed the small town feel, hanging out at the square and appreciated the Hondurans who went out of their way to be friendly to us. One guy at the store followed us around, volunteering to help us find everything, including some Honduran beer. Later we realized the beer was actually from Poland. The ruins I have long wanted to visit were just down the road. 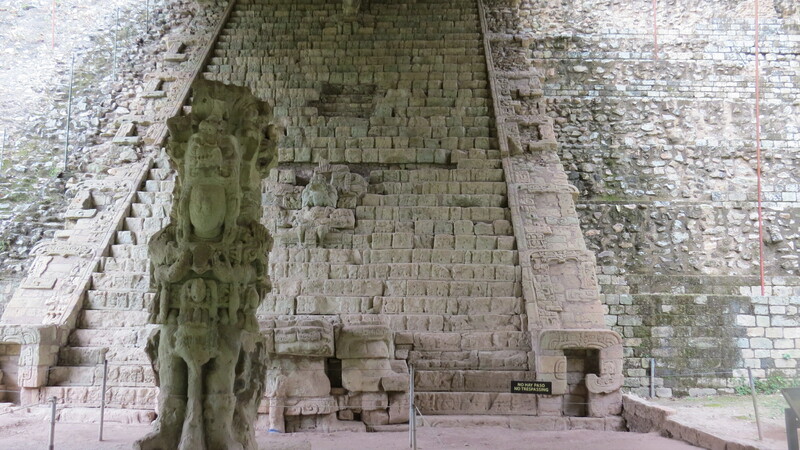 Set in a jungle, the Copán Ruinas are known for numerous stellae, a large ball court, a grand hieroglyphic staircase and underground tunnels. The site differs from other ruins in that the stellae, walls, and alters are covered in very detailed hieroglyphics, and intricate carvings of important early Mayan rulers. 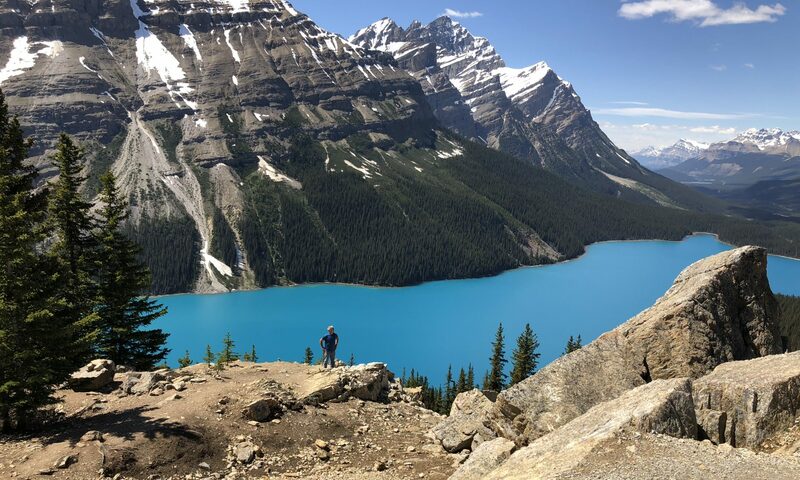 Few other tourists were there and we had a pleasant morning exploring it all. 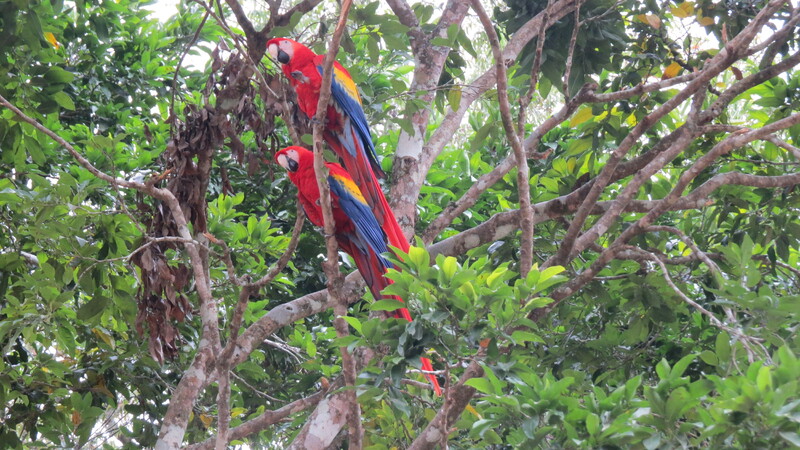 We were equally enthralled with the raucous macaws, their blue, yellow, and red plumage completely brilliant against the green foliage. 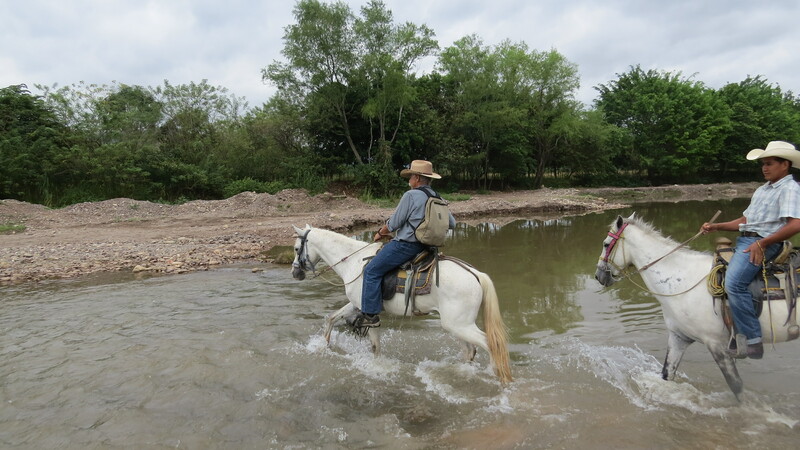 That afternoon we took a horseback ride with a guide named Walter. We rode lazily along the river, then up a steep dirt road to a mountain village, past farm land, herds of cows, and men walking with machetes. People waved as we passed, calling out greetings. Children raced to see us, then stood still, awkward and shy as we rode by. For a while we were followed by Anita and her brother Juan Carlos, who were very cute. When we arrived at the village we dismounted and were immediately accosted by chattering children, all selling corn husk angels for the Christmas tree. Twelve arms were enthusiastically thrust to my face, each hand holding a painted angel. This was hard. I bought one. Then at a woman’s tienda we met with one of the weavers and she demonstrated the loom, a purple scarf in the making. She told me that it takes her three days to make one cotton scarf. I bought a blue one for $10, but later wished I had bought more. In camp, we spent a pleasant evening chatting with Ton and Chantelle from the Netherlands who have travelled the world. Like many Europeans we have met, their rig is extremely large, this one built on the back of a former rescue truck. It dwarfed our van by a long shot. They had just come up through Honduras and gave us tips on places to stay. In the morning we headed east on highway 5 and then south on 4, thankfully turning away from San Pedro Sula, which only a few years back was dubbed as the murder capitol of the world. Not a place to stop and shop. Both of these highways are under construction and once completed will be an amazingly wide smooth cement highway. Although there was often only one lane available, we seemed to hit all the green Go signs, and we made good time. Scenery wise, Honduras is fairly similar to Guatemala, except the mountains seem lower, and the valleys wider, so that we did not feel as closed in. We made our way to a favourite overlander spot, the D&D Brewery, located close to Lake Yojoa. A micro brewery and hotel, it was built by a friendly American named Bobby. 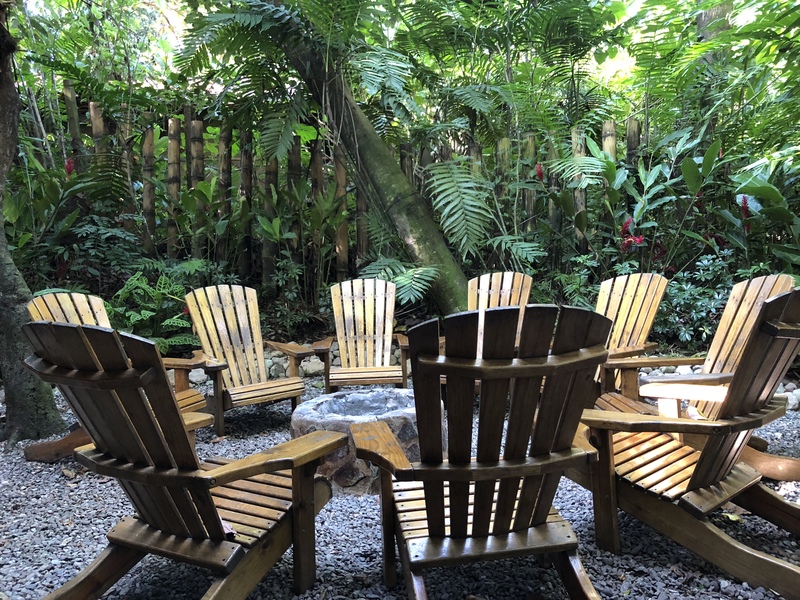 The outdoor restaurant is nestled in the jungle, with different sizes of hummingbirds flitting about, and all types of seating areas to relax. 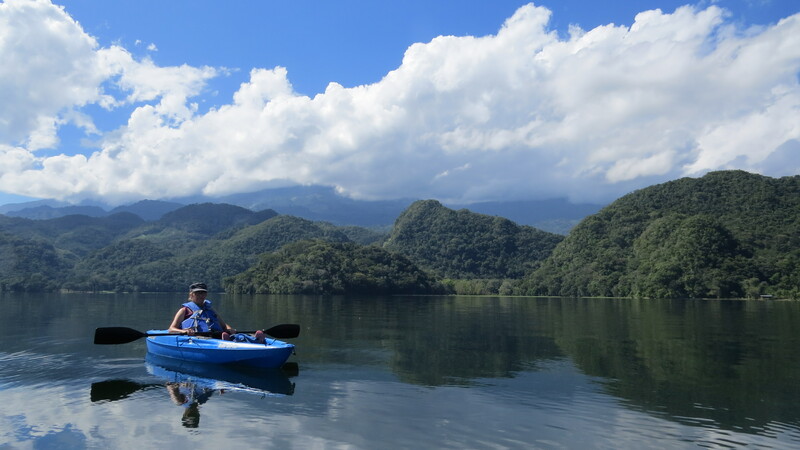 We were excited to explore the lake and so rented kayaks for a 3–hour cruise. There are bass in the lake, and we paddled passed about a dozen local men in row boats, fishing with just a line, no rod. 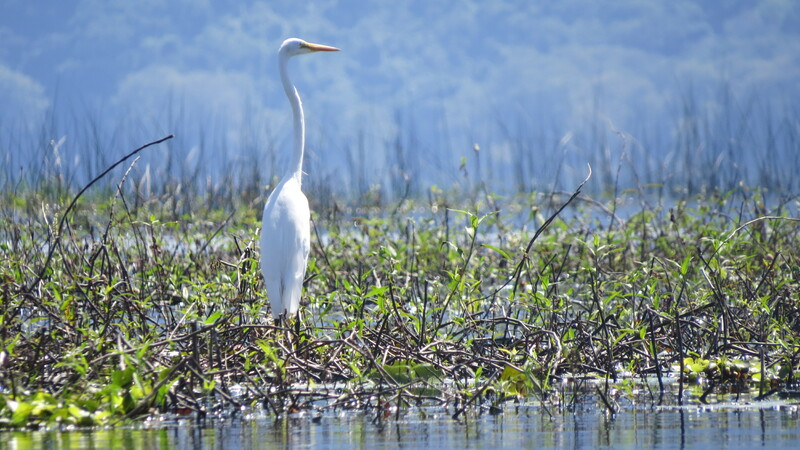 Along the shore we saw birds that we know, such as kingfisher, crane, hawk and the Jesus bird who can walk on water. But many others we did not recognize, and some we only heard, sending forth crazy hoots and screeches from the jungle. We passed a small home tucked into the bank, cows in the yard, laundry on the line, and a woman having a bath in the lake. Other guests at D&D included backpackers from Germany and Finland, overlanders from the US, and local Hondurans enjoying an evening out. One evening we met Dianne from Edmonton, whose sister Laverne Chetyrbok lives in Grandview, close to my hometown. That was a nice surprise. Dianne was there with a Christian group who try to provide opportunities for kids to attend school. Later talking with owner Bobby, we asked many questions, and listened to his reasoning on why migrants from Honduras would leave this fertile, beautiful land, risking the perils of walking all the way to the USA. His take, my interpretation, is that because of dire poverty, high unemployment, and serious political corruption, many Hondurans see absolutely no hope for a future in their own country. Leaving these lush mountains and their small villages, we drove Highway 5 southward, on a wide smooth double lane, a delightful drive until the city of Tegucigalpa. The capitol city of Honduras, it’s sprawl extends from the valley core up into the surrounding hills. Taking the freeway around the city we ended up on a crowded, rough, single lane road. Here we encountered many cars in poor health, either having no lights or no power, and the use of signal lights seemingly optional. While you slow for them, impatient drivers dart in and out, cutting off your intended trajectory. Unbelievably, one car actually slowly backed onto the highway, just as we come speeding along. What were they thinking? It was tense and chaotic. Finally away from there, we had another hour of a pothole riddled roadway. Dodging deep holes, and dodging oncoming vehicles who were also dodging holes, became an entirely new game. About 3 pm we arrived at the hotel Villa Alejandra, near the town of Danli, it’s lush quiet grounds offering us a needy respite from one crazy day on the road. Love to read of your adventures. I really liked Antigua, too. Your travels are bringing back good memories. Kara, made it home for Christmas. I had been out the beginning of Dec to visit her as she thought she wouldn’t be home for the holiday ! Thinking of you two. Hoping you can teach us how to make tamales when you come home. Anyway, you two have a great Christmas & New Years in the sun.